SciCast is a crowdsourced forecasting platform based on the idea that the collective wisdom of an informed and diverse group can be gathered and used to accurately predict future events. SciCast is a community-driven initiative. Participants write their own questions in our publishing tool called Spark and participate in a process to get those questions published. SciCast participants can make forecasts at any time about any published question. 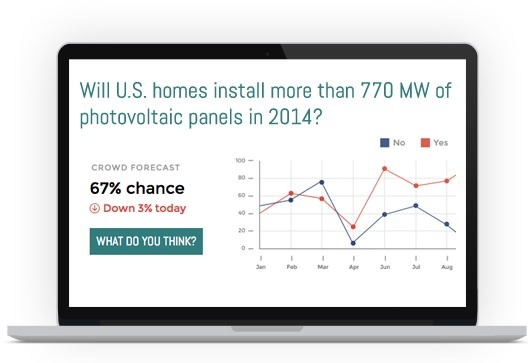 Unlike a survey, participants can change their forecast at any time to account for new information. In this way, SciCast is a real-time indicator of what our participants think is going to happen. Technically, SciCast is a (combinatorial) prediction market. Prediction markets can be used to forecast the outcome of a wide variety of topics and are used today in large corporations and governments to understand the likelihood of meeting key performance metrics, quantify risks that may jeopardize operations, and better understand industry trends. It works, approximately, like this. First you corner a large - if possible, a very large - number of people who, while they've never formally studied the subject you're going to ask them about and hence are unlikely to recall the correct answer, are nonetheless plugged into the culture to which the question relates. Curiously, when you consolidate their replies they tend to cluster around the actual figure as recorded in almanacs, yearbooks and statical returns. Well, if it works for the past, why can't it work for the future? Three hundred million people with access to the integrated North American data-net is a nice big number of potential consultees.